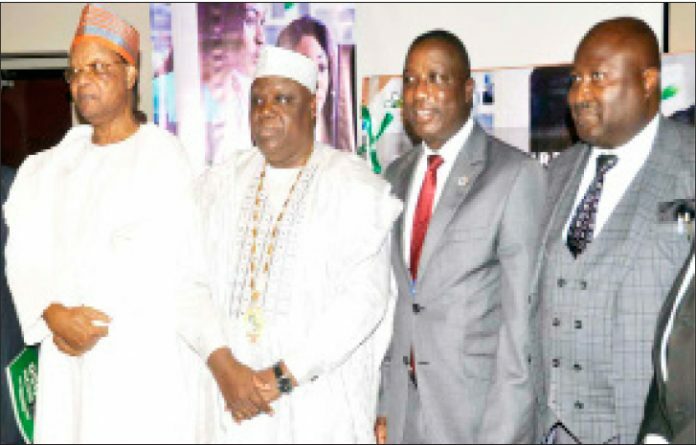 L-R: Prince Julius Adewale, Nigerian Pharmacist and legal practitioner; Pharm Ahmed Yakasai, President, Pharmaceutical Society of Nigeria (PSN); Chairman, Pharm Lekan Asuni, Nigeria Pharmaceutical Industry IT, Platform Project; Pharm. Olumide Akintayo, Past president of PSN, during the launching of the Pharm iT NDDG online Platform, and PSNPay, Online Capitation Payment platform and unveiling of PSN Vision 2050 Strategy document held at Sheraton hotels, Ikeja, Lagos on Tuesday. R-L Pharm. 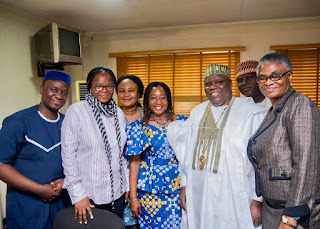 Tosin Adeyemi, National Editor in Chief, Pharmaceutical Society of Nigeria (PSN); Dr. Arinola Joda, Publicity Secretary, PSN; Rosemary Nikoro, Secretary, Board of Fellows, PSN; Pharm Ahmed Yakasai, President; Pharm. Bolanle F. O. Adeniran, Chairman, PSN Lagos State and others, during a press conference on the forthcoming 91st annual national conference of PSN scheduled to hold from October 29 to November 3, at lbadan Oyo state, held in Lagos, weekend. Corroborating this old saying, the recent report of World Health Organisation (WHO) said; “More than half of all medicines are prescribed, dispensed or sold inappropriately, and that half of all patients fail to take them correctly. “The overuse, underuse or misuse of medicines results in wastage of scarce resources and widespread health hazards,” the world health body added. Irrational use of medicines is a major problem worldwide. And acting in sync with the WHO’s findings, the Federal Government released a New Drug Distribution Guidelines (NDDG) in 2012. However, there are concerns among experts over the Federal Government’s delay in implementing the National Drug Policy, more so as they believe it will promote local drug production and reduce dependence on imported medicines. In view of these, the Pharmaceutical Society of Nigeria (PSN) has launched a pharmaceutical information technology (IT) platform. According to PSN, the online platform will improve drug distribution channel and ensure safety of medicines in compliance with NDDG. Known as Pharma IT NDDC Platform, it was launched in Lagos Tuesday, alongside the PSN Pay, a digitalised system of payment and collection of PSN annual capitation and other technical and interest groups of the society’s dues both in states and national. Pharm. Ahmed Yakasai, PSN President had earlier announced the launch at a press briefing in Lagos on the forthcoming 91st annual national conference of the society, saying, the online platform would improve the distribution channel and enhance the safety and efficacy of medicines. Yakasai explained that the new IT platform would act as a regulator in the distribution and use of medicines among manufacturers and consumers, thereby improving the distribution channel and enhancing the safety and efficacy of medicines. Yakasai said; “Pharmit is a pharma industry IT solution facilitated by PSN under our leadership to compliment implementation of the National Drug Distribution Guidelines (NDDG). “Also, it will serve as a central repository and interface for exchange of information for the practitioners and practice, as well as, provide visibility to the Regulators (PCN, NAFDAC, etc) for control and fight against fake, substandard and falsified products, all around the real time dynamics of premises, products and practitioners involved in the distribution of medicines in Nigeria. According to the PSN boss, the platform is open to all pharmacists and pharmaceutical outlets in the health-delivery value chain of the country. Concerning the PSN Pay, Yakasai said the existing collection process is manual, rigorous and prone to error which needs to be overhauled and digitalised, noting that this was part of his campaign promises. However, the President explained that the new digital mode of payment would improve on the operation of PSN in collection of dues by its members and also reduce the stress of capitation payment by pharmacists. He said; “Psnpay is going to digitalise the payment and collection of PSN annual capitation and other technical and interest groups of PSN dues for both states and national as powered by Chamsswitch. “The existing collection process is manual, rigorous and prone to error which needs to be overhauled and digitalised as promised during my campaign. “PSNpay is an end-to-end automated payment/ collection platform that will ultimately improve operational efficiency of PSN and its technical and interest groups. “PSN pay will improve on the current manual process of collections made by PSN members and reduce the stress of capitation payment by pharmacists. “It will enhance transparency and accountability. It will avoid reconciliation issues; enhance reporting system and also improve operational efficiency,” he noted. Yakasai, further appealed to the government as a matter of urgency to take critical action to implement the National Drug Policy in order to promote local drug production and reduce dependence on imported medicines. Yakasai said the implementation of the National Drug Policy, which would eliminate the present chaotic drug distribution system in the country, was key to ending Nigeria being made a dumping ground for all sorts of unwholesome and substandard imported drugs. Concerning drug tracking and recall, he said being able to track drugs within the system, was necessary because of situations when medicines in circulation would be recalled to safeguard the health of the consuming public. The PSN President urged Nigerians to be on the alert against any contaminated drugs imported into country from China. On the forthcoming 91st annual national conference of the society, the PSN President stated that its theme is; “Innovative Disruption in Pharmacy in Emerging Economies: A Roadmap for Nigeria,” was carefully chosen to advance the national discourse on survival and significance in a time of fast and tempestuous transformation. The PSN boss revealed that the conference which would hold from October 29 – November 3, 2018 in Oyo State, will witness the attendance of not less than 5,000 pharmacists and pharmaceutical scientists nationwide as well as those in diaspora. He also said that it would be a forum to exploit avenues to improve contributions from the pharmaceutical sector to the nation’s economy. While the conference would be declared open by Dr. Bukola Saraki, the Senate President, as a special guest of honour, Abiola Ajimobi, the Oyo State Governor would be the chief host. Pharm. Clare Omatseye, the President of Healthcare Federation of Nigeria (HFN) and Chief Executive Officer/ Managing Director of JNC international Limited is expected to be the keynote speaker. Similarly, the Olubadan, Oba Saliu Akanmu Adetunji would be the royal father at the opening ceremony. “We would also have our election during our annual general meeting (AGM) to vote in new leadership,” Yakasai added. In all, a week-long activity have been planned to hold during the annual conference. The health walk to be led by the wife of the Oyo State Governor, Mrs. Florence Ajimobi is tagged “Pharmacists Against Drug Abuse” would hold on Monday, October 29 after the arrival and registration of delegates. Furthermore, he said there would be a Health Outreach at the Palace of the Olubadan in Idiarere. According to the president of the PSN, “Nigerians should expect a positive force of disruption to emerge pharmaceutically after November 3. Commenting, Pharm. Lekan Asuni, observed that the pharma industry will benefit greatly from IT solutions that ensure the right drugs are sold by the right practitioners at the right premises in view of the menace of drugs abuse and recurrent cases of counterfeit and unregistered drugs. Pharm Asuni who is the Nigeria Pharma Industry IT Platform Project Chairman, explained that the project aims to be the largest drugs supply chain system in Africa. He said, the major objective is to have a comprehensive IT driven industry from the source, local/import, to the consumer of medicines in the country. According to him, the IT Platform will “Enable track and trace of medicine in the supply chain; Harness the information and interaction of registered practitioners and products on a single platform. “It will also, create access for the consumer of health for information on products and their feedback; generate data for industrial use, among other things.